If you ask me what I want for breakfast, I’ll most def say PANCAKES! 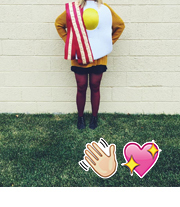 … unless I say waffles. But most the time, I want pancakes. So much so, that I have a little chalkboard in the kitchen with a basic buttermilk recipe written out for pancaking on the quick! So, why not have a cookie that tastes like that breakfast favorite? 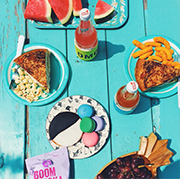 Why not stack them and eat 8 at time, snack-style? Basically I’m into maple-y goodness. And if I can have it on my breakfast and on my dessert, I’ll take it. So let’s have pancakes all day, ok? 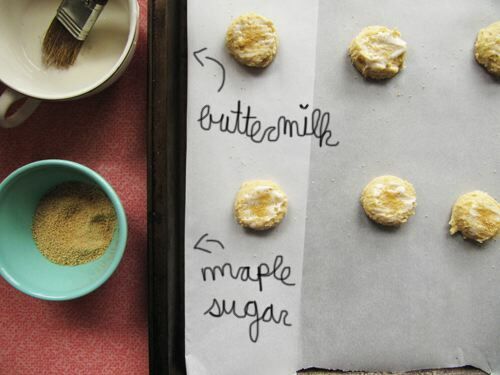 Let’s remix some cookies breakfast style featuring maple sugar and brown butter. Oh! 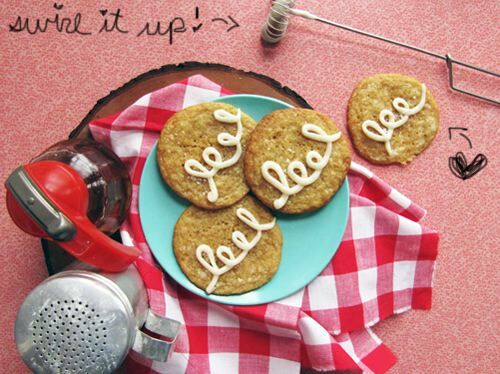 And these cookies are a thin chewy miracle with a swirl-y accessory to boot! * If you don’t have maple sugar, use granulated and add a bit of maple syrup to taste. 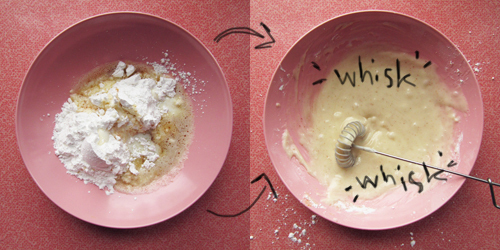 In a small bowl whisk together flour, baking soda, baking powder, and salt. In a large bowl, using an electric mixer, cream together the butter and sugars. Beat in egg and vanilla. Gradually mix in the dry ingredients. Add about 3 tablespoons of buttermilk just to moisten the dough, but not make it wet. Roll rounded teaspoons of dough into balls an place on prepared baking sheets. Slightly flatten the dough rounds a bit and brush with the remaining tablespoon of buttermilk. Sprinkle with more maple sugar. Bake for 8-10 minutes or until slightly golden. Let stand on the baking sheet for a couple minutes and then transfer to a wire rack. Allow to cool before topping with icing. Make glaze by melting butter in a small sauce pan over medium heat until 4-5 minutes, or until browned. Pour over confectioners’ sugar and a teaspoon of maple syrup in a small bowl. Stir in vanilla and buttermilk until smooth and glazey. Transfer to a sandwich bag and snip the corner. Pipe swirls over your cookies and sprinkle with sea salt. Yay! Click HERE for a printable pdf for the recipes above. Elliot is a slick-rick at the vet now. 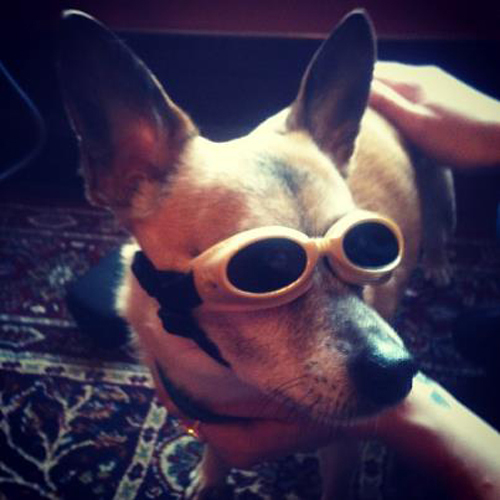 Pup goggles! Megan, you have just blown my mind. YUM. I love that they’re so thin! I’ll have to try that out sometime with gluten-free flour. Oh! Let me know if you make these gluten-free! That’d be lovely. let’s just have cookies for breakfast and pancakes for dessert! ummm not quite sure how i let that maple brown butter icing pass me by the first time?? i won’t let it happen again! and you know most people would do like a zigzag design and i love how you love a nice swirl! finally…are you watching mariah on idol? i’m scared. i did not tune in last night. i like to keep 90s mariah in my mind. Yeah girl! That icing changed my life. And I haven’t seen any of the Mariah episodes. I’ve only seen tid bits at the gym. I’m scurred too! Yessssssss. 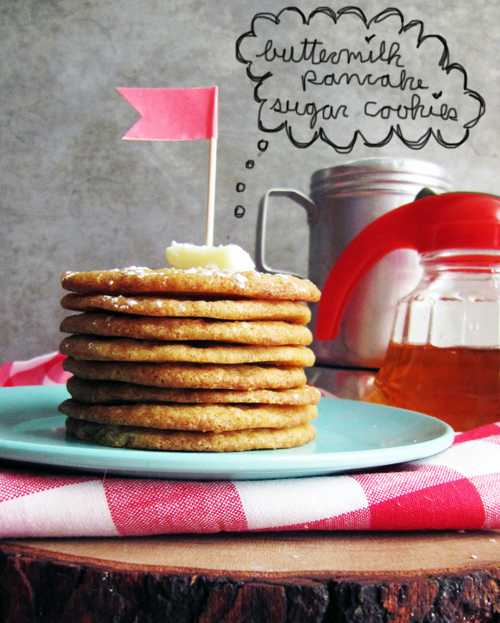 And because pancakes are a breakfast food, I can totally eat these cookies for breakfast…right? Oh, maple sugar! Brings back fond memories of baking at culinary school, when we would use it as a “health-supportive sweetener” and replace white sugar in all of our recipes with it. It definitely gave all of our sweets a vaguely pancake-y taste, but I love maple and I love pancakes, so it was all good by me. These are simply darling!